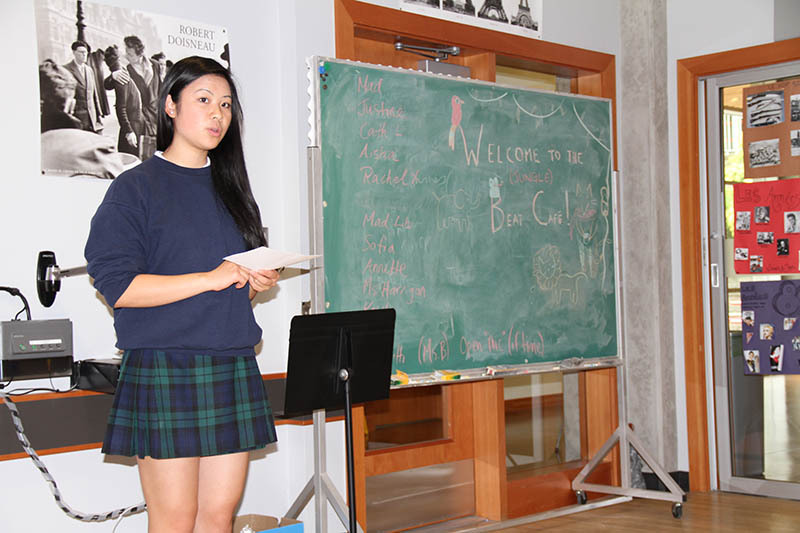 Some of our creative writers and a few staff members gathered in the Bentley Room for treats, readings and sharing of creative writing pieces during Tuesday’s Beat Café. Thank you to all our brave readers and audience members for being such attentive listeners! Included below is one of the readings, a poem from Kira H.
Drama Teacher Ms. Harrigan reading an excerpt from one of her stories. Look at your face, but don’t look too hard. See that mole? Those freckles? Crows feet? Do you see the tired eyes, the furrowed brow, and the downturned smile? Do you hear your laughter? Do you see the life shining in your eyes? Like music, bright orbs of love and intelligence float lightly. Or the looming shadows of cynicism, hatred, and criticism resound in the thick air. For a minute you can forget divorce, death, and the diverging of two thoughts that were supposed to mingle together carelessly but didn’t. But sometimes they will hit you as you sit in the corner of some coffee shop on an idle Tuesday. Realize that those little lines indicate how many years you have been on this earth and inspired people, made them laugh, made them feel something. They make you apart of something big. They draw you into a group of reality, truth. When you feel the bumps you can say this is me. Your skin is cracked because it can only attempt to hold back your endless ideas and emotions that pulse inside you. You see the little lines as lines. Not as the markings of a warrior. See yourself for who you are, not masked by imperfection. Your beauty can be heard in the sound of your voice, your laughter.